The Diamond Sutra, composed in India in the fourth century CE, is one of the most treasured works of Buddhist literature and the oldest extant printed book in the world. 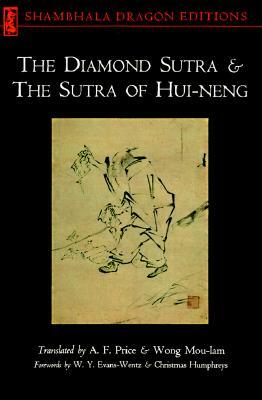 It is known as the Diamond Sutra because its teaching is said to be like a diamond that cuts away all dualistic thought, releasing one from attachment to objects and bringing one to the further shore of enlightenment. The Sutra of Hui-neng, also known as the Platform Sutra, contains the autobiography of this pivotal figure in Zen history and some of the most profound passages in Zen literature. Hui-neng (638-713), the Sixth Patriarch of Zen in China, is often regarded as the true father of the Zen tradition. A poor illiterate woodcutter, he was said to have attained enlightenment upon hearing a recitation of The Diamond Sutra. Taken together, these two scriptures present the central teachings of a major Buddhist tradition and are essential reading for all students of Buddhism. A. F. Price is the translator of the ancient and revered Zen Buddhist scriptures The Diamond Sutra and the Sutra of Hui-neng. In her book Embracing Illusion: Truth and Fiction in the Dream of the Nine Clouds, author Francisca Cho praised Price's work for its "readability and faithfulness to Kumarajiva's Chinese translation."